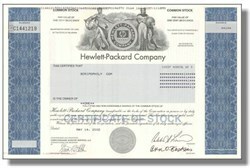 Beautifully engraved certificate from the Hewlett-Packard Company . This historic document was printed by the American Banknote Company and has an ornate border around it with a vignette of an allegorical man and woman holding globes standing on both sides of the company logo. This item has the printed signatures of the Company�s President ( Carly Fiorina) and Secretary ( Ann O. Baskins ). Hewlett-Packard (HP) provides computers, imaging and printing peripherals, software, and computer-related services. The company has seen extensive restructuring under the leadership of CEO Carly Fiorina, who spearheaded the largest deal in tech sector history: the acquisition of Compaq Computer in a stock transaction valued at approximately $19 billion. HP is a leading global provider of products, technologies, solutions and services to consumers and businesses. The company's offerings span IT infrastructure, personal computing and access devices, global services and imaging and printing. HP completed its merger transaction involving Compaq Computer Corp. on May 3, 2002. HP serves more than one billion customers in more than 160 countries on five continents. HP has approximately 141,000 employees worldwide. HP's mission is to invent technologies and services that drive business value, create social benefit and improve the lives of customers�with a focus on affecting the greatest number of people possible. HP dedicates $4 billion (U.S.) annually to its research and development of products, solutions and new technologies.